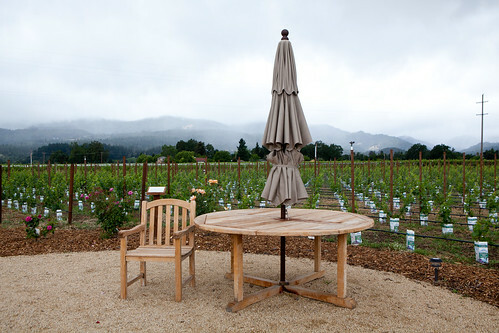 When I was in San Francisco earlier this month, my family and I did make a trip up to the Wine Country. First was the olive oil tasting and this stop to Raymond Vineyards was an interesting one, as we met Anna to give us an informative tour. 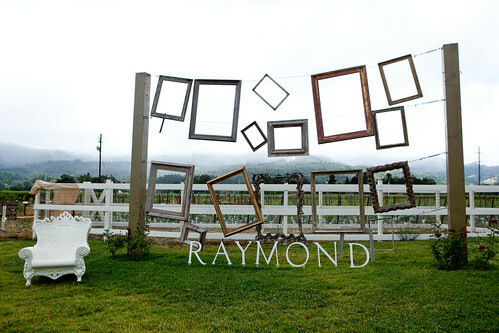 Raymond Vineyards was founded in 1970 by Roy Raymond with his two sons, Roy Jr. and Walter. Today, it’s under the helm of Jean-Charles Boisset, the proprietor of Boisset Family Estates, Director of Winemaking Stephanie Putnam, Assistant Winemaker Kathy George, and Vineyard Manager Eric Pooler to create the elegantly powerful yet balanced wines Raymond Vineyards is known for. 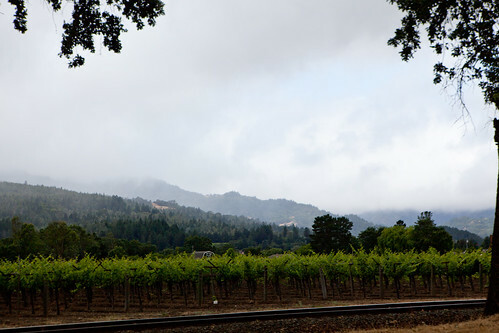 Raymond Vineyards has a total of 301 acres from their St. Helena Estate (10 acres), Rutherford Estate (81 acres), and Jameson Canyon Vineyards (210 acres) to grow and harvest their grapes. 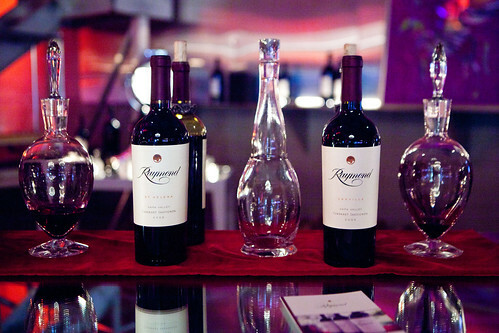 Raymond Vineyards are known mainly for their red wines, primarily for its Cabernet Sauvignon. But they do make Merlot, Sauvignon Blanc, Syrah, Meritage (red and white), and Chardonnay. 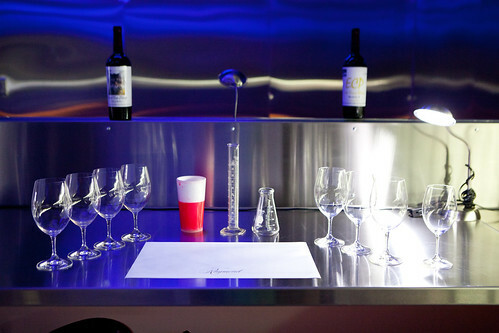 This particular winery wanted to go beyond the traditional wine tasting route and have an interactive experience between the winery’s grounds and the visitor. 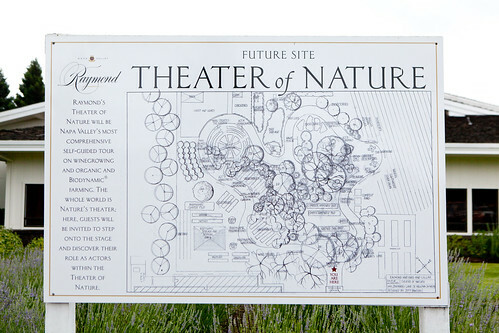 The first thing you’d notice when you walk on their grounds is the 1.5 acre Theater of Nature, especially with the crowing of a rooster. 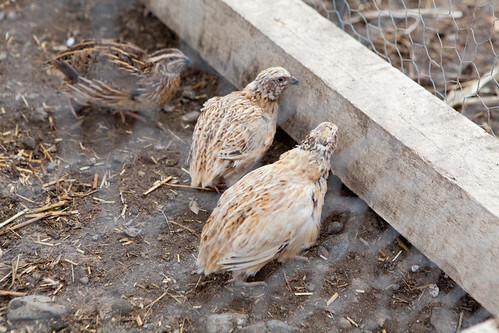 The concept is to educate visitors on the importance of sustainable, organic, Biodynamic farming. All of this is a self-guided area that you could walk around at your own pace or there’s an audio guided tour by scanning their QR code with your smartphone and take it from there. 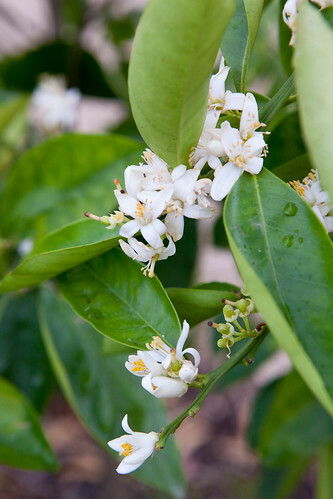 I encountered various vegetables, shrubs, and fruit trees that I have never seen in New York City (e.g. see pomegranate budding fruit and smell the beautifully fragrant blossoms of a blood orange tree). 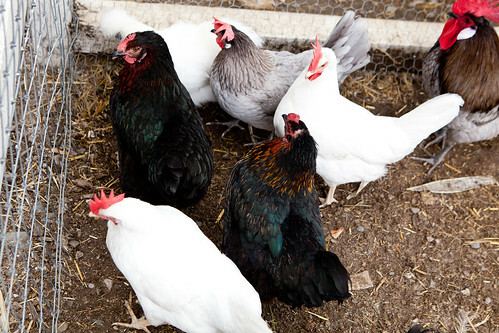 When I walked further into the property, there’s curious farm animals like goats who wants your attention by walking up to their fenced area and poke their heads out, hoping for food from visitors; various species of chickens and little quail birds scurrying around their own fenced area. 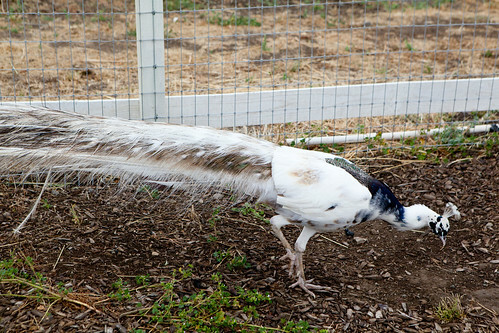 There’s even a pair of beautiful male and female white peacocks walking in their area as well. Entering the building and turned right and straight down the hall is their Crystal Cellar. 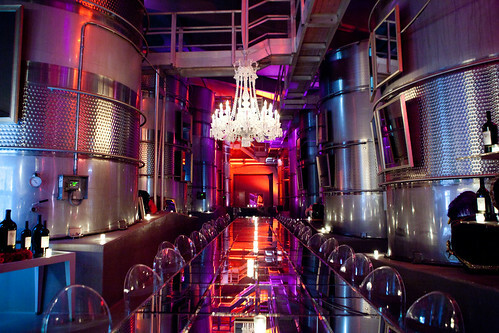 This dark, club-like atmosphere is mostly decorated of working stainless steel vats that second as walls, mirrored bar and decorated with the French luxury crystal Baccarat (the gorgeous chandelier and historical crystal decanters). 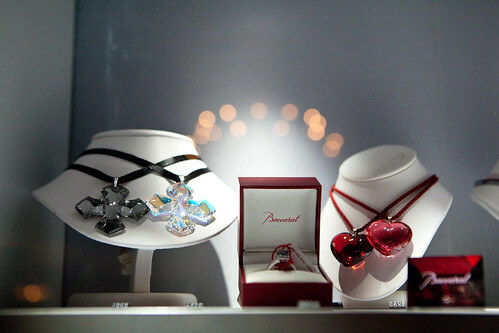 They also do sell some of Baccarat’s beautiful crystal jewelry and figurines. 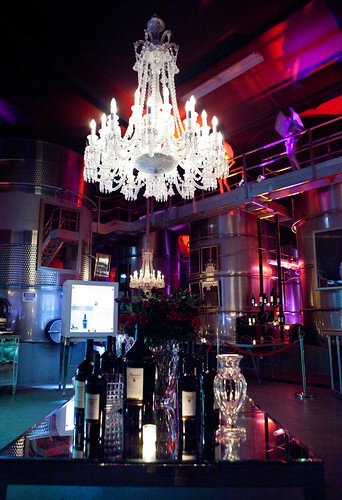 In this particular room, they have a special flight of four different vintages of Cabernet Sauvignon. 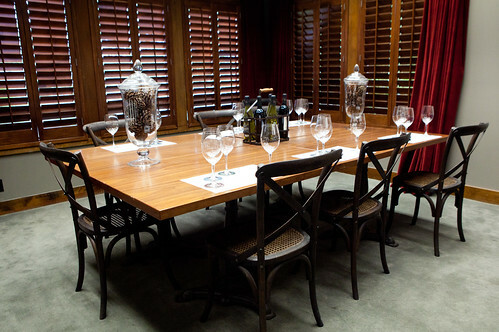 There are other tasting rooms for private wine tasting and educational classes like the Barrel Room, Blending Room, Library Room, and the Rutherford Room. 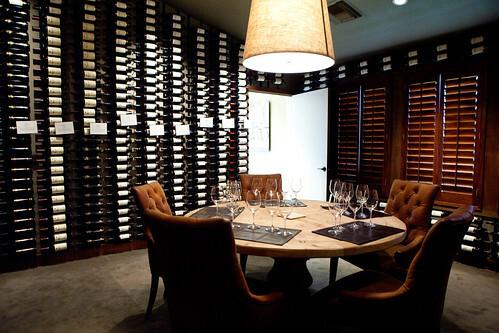 The Library is an exclusive room behind the main Tasting Room that offers vertical wine tastings of some of their older vintages dating back to 1974. 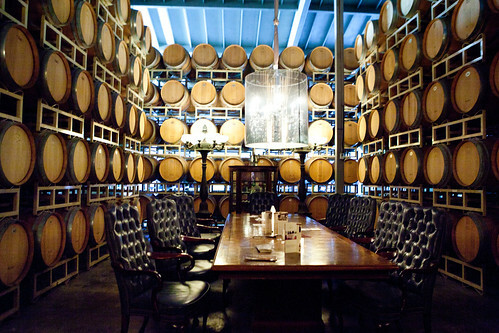 The Barrel Room is surrounded by oak barrels on all sides and illuminated by candlelight. It’s an intimate area to sample their wines. 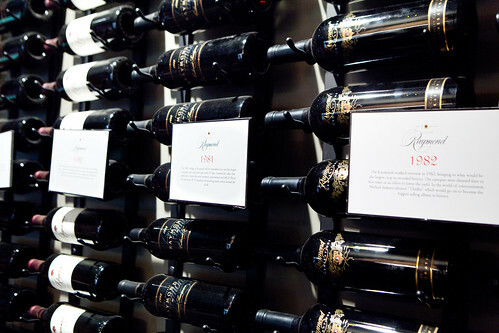 The Rutherford Room is an educational room created by one of Napa Valley’s preeminent American wine author of The Wine Bible and wine educator Karen MacNeil. 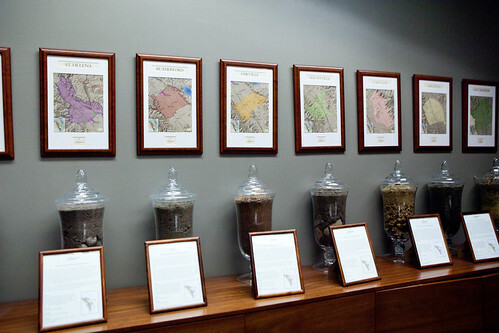 This room displays samples of various areas of Napa Valley’s soil in large glass jars and a map of Napa with its own counties to distinguish how these differences of terroir affects the wines you drink from a certain region. 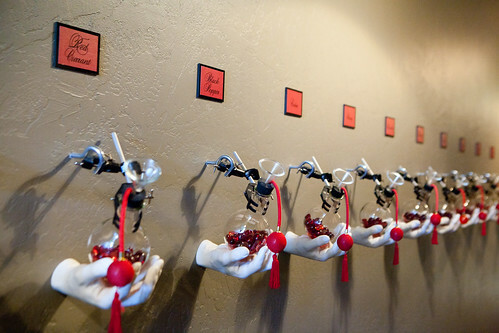 There’s the Corridor of Senses that could enhance or build up a wine taster’s vocabulary. 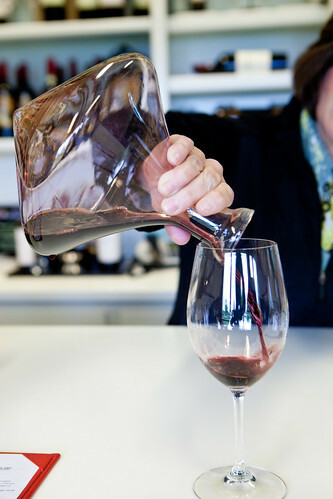 Visitors could touch different patches of fabric to get a feel how it’s like on the palate. The aroma section, where there were hands with atomizers that one can squeeze and smell a certain scent like honey, blackberries, etc. 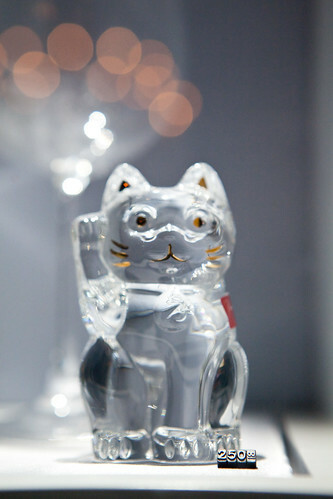 that you would find in a glass of complex wine. 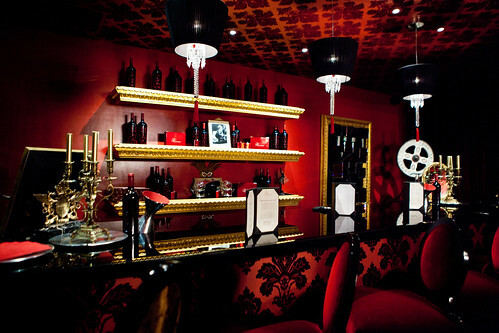 The final room we visited prior to tasting was The Red Room, an exclusive room for its members. 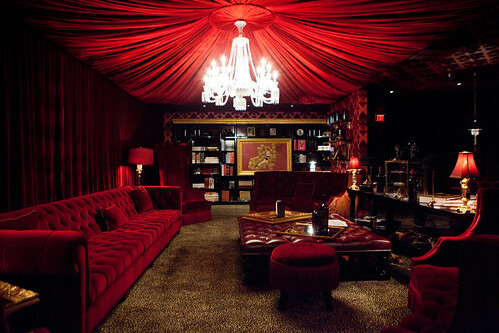 This very red, lush, dark and handsomely decorated room makes you want to relax. 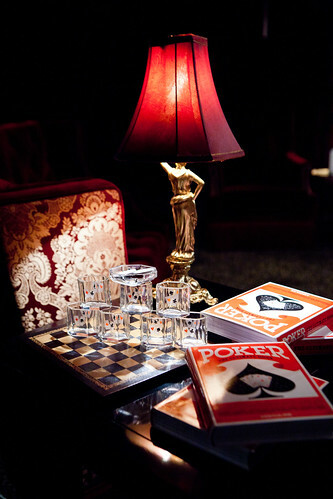 The furniture is plush and there were games like pool, chess, or poker, to play if one is interested in doing so. There’s also a special red wine blend served only available to guests of this club. At the end of our tour, we tasted some of Raymond Vineyards’ wines at their main Tasting Room. 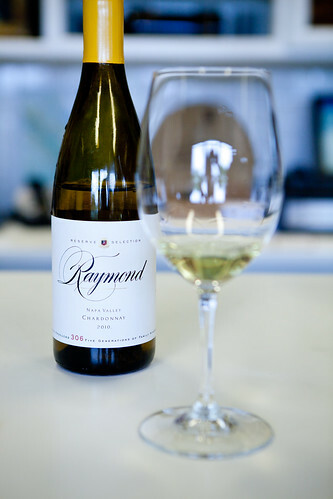 The 2010 Reserve Selection Chardonnay opens with aromas of honeysuckle and pear that are enhanced by notes of orange blossoms and toasted almond. Full-bodied with great balance, the wine displays flavors of white peach and smooth vanilla, ending with a long, rich finish. 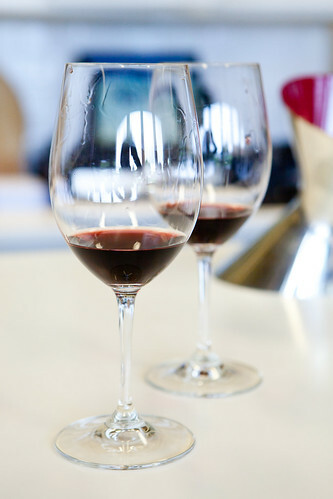 The 2008 Reserve Cabernet Sauvignon has concentrated aromas of mixed berries, boysenberry, molasses and blueberry, followed by hints of cedar and anise. This is a full-bodied Cabernet, big wine that is rich and velvety. The 2008 Barrel to Barrel Cabernet Sauvignon has aromas of bright, red jammy fruits with flavors of cherry and strawberry. There were notes of plush blackberry, and dark cherry are followed by hints of tobacco and violet. What makes this particular wine interesting is that this particular consumer purchases an eco-friendly barrel of wine (3 liters or 5 liters) from the winery. The wine is protected from oxidation for up to 6 weeks after opening.